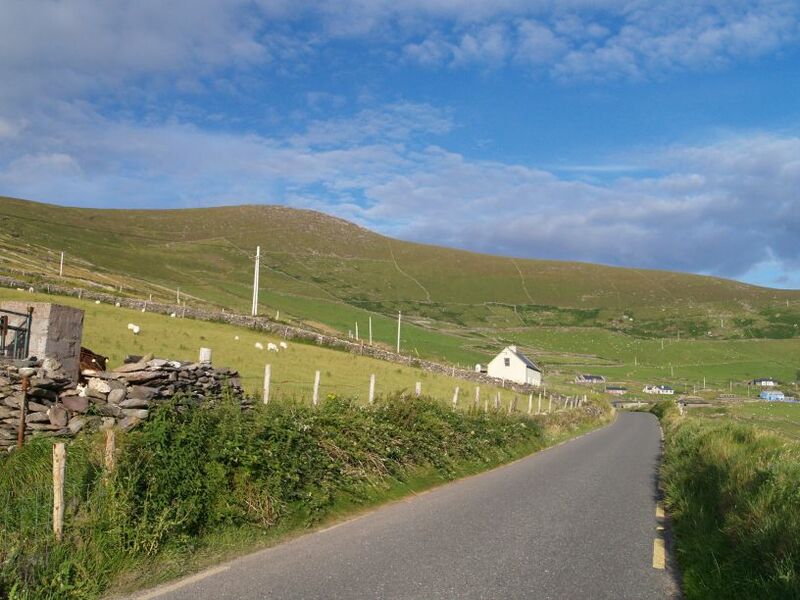 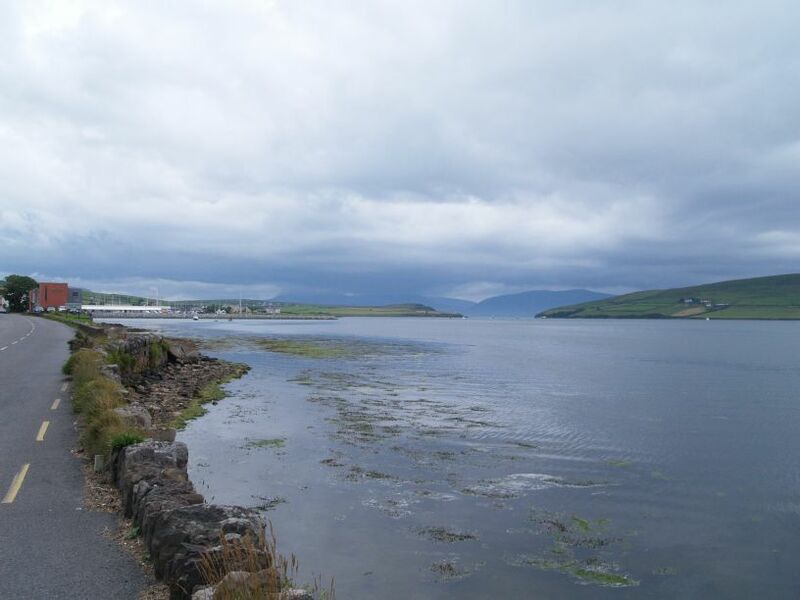 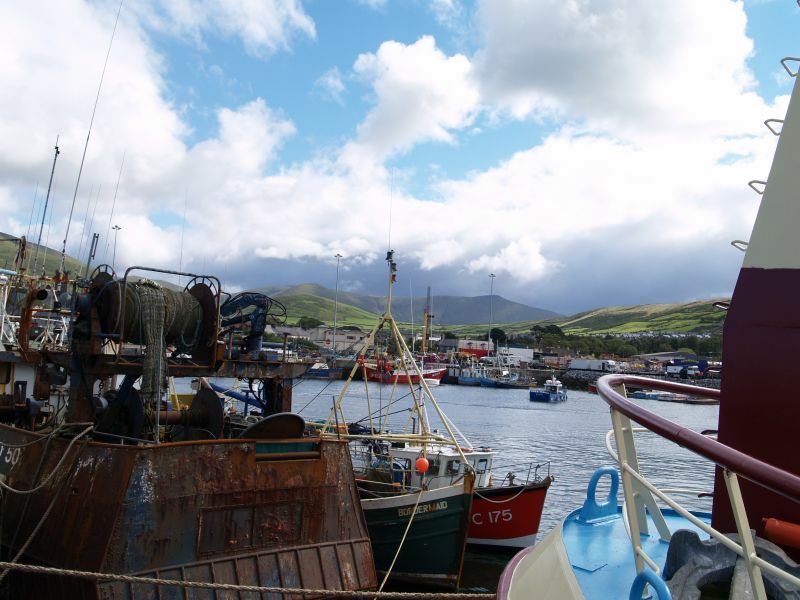 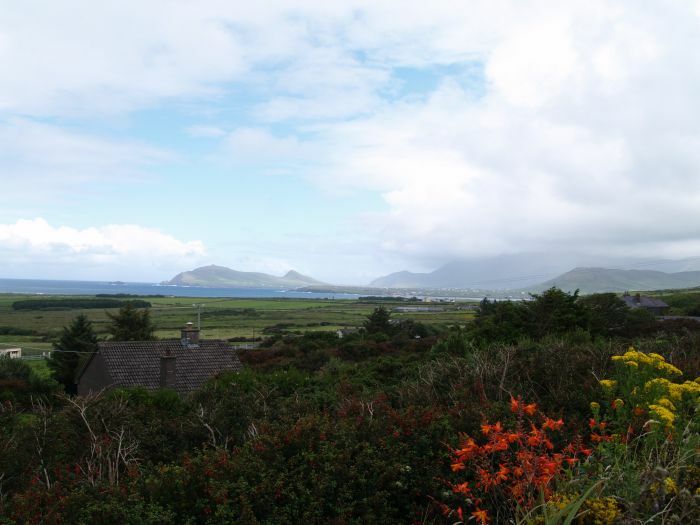 Starting from Dingle Town and Harbour take the westerly R559 road to Ventry Bay (more Ventry Bay pictures or more Dingle pictures). 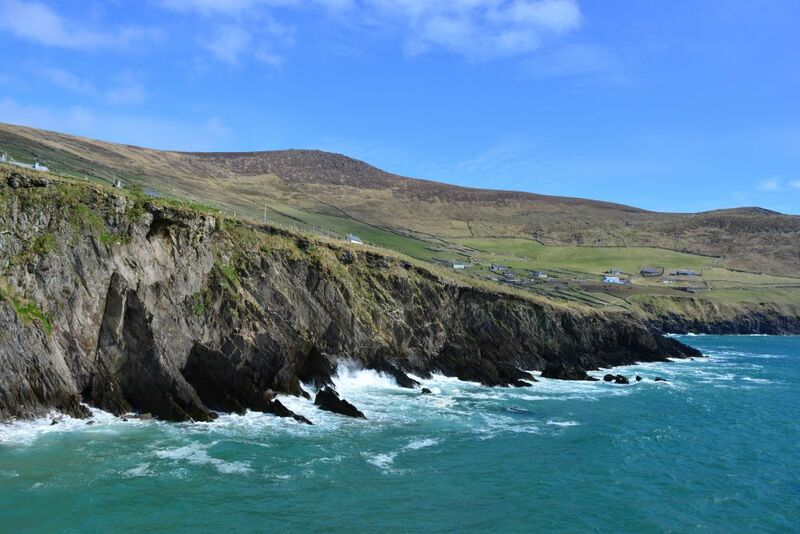 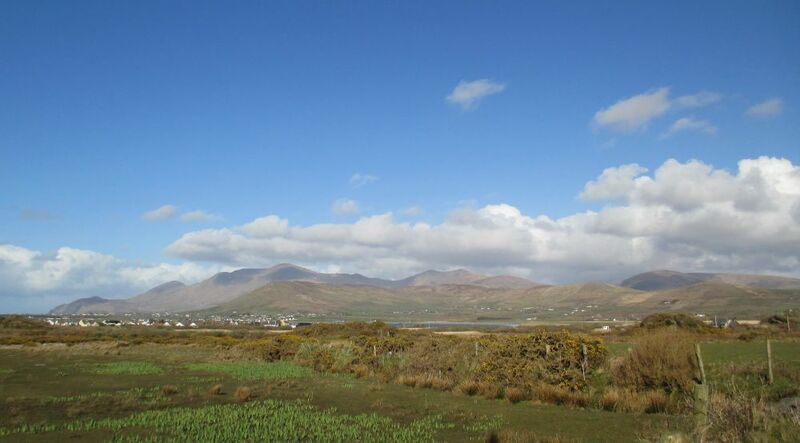 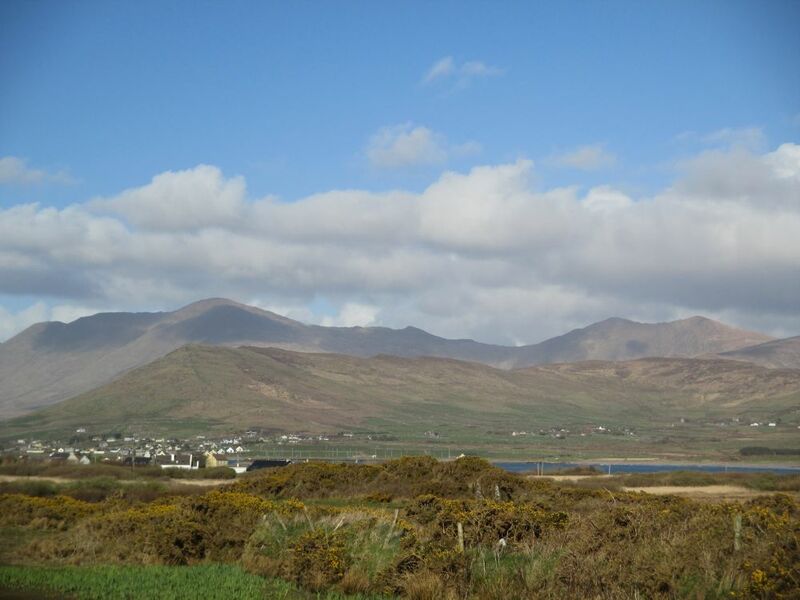 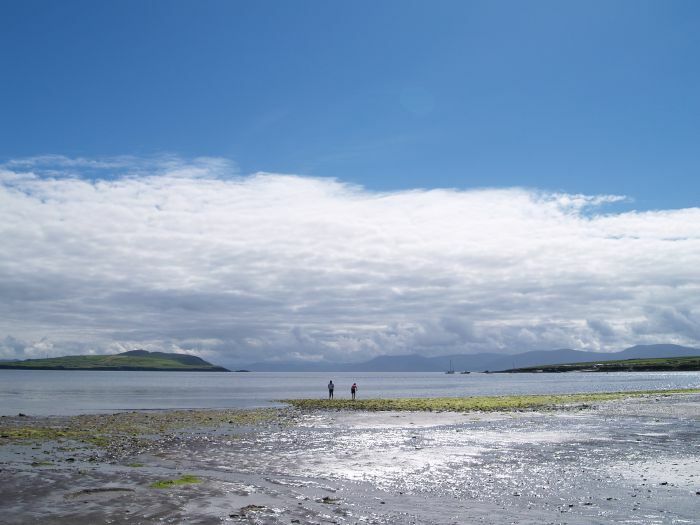 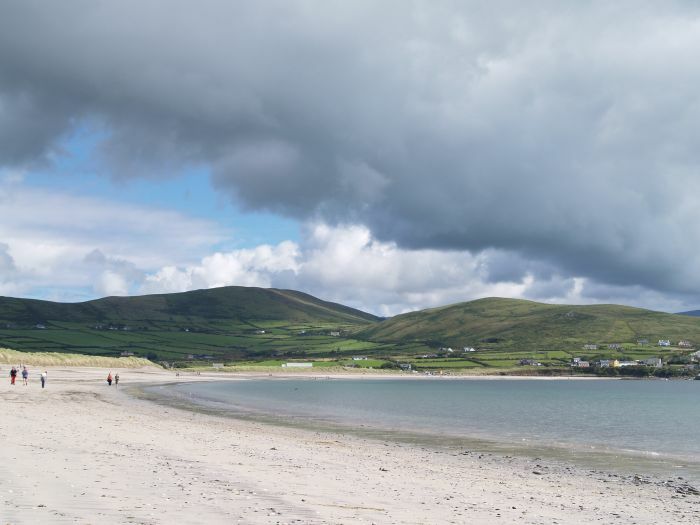 The lovely beach at Ventry Bay with its scenic backdrop of hill and mountain scenery. 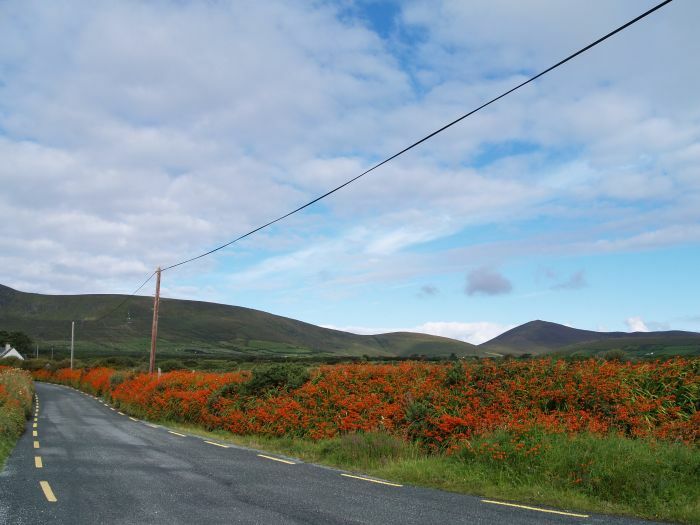 Continuing westwards passed wonderful hedgerows of monbretia. 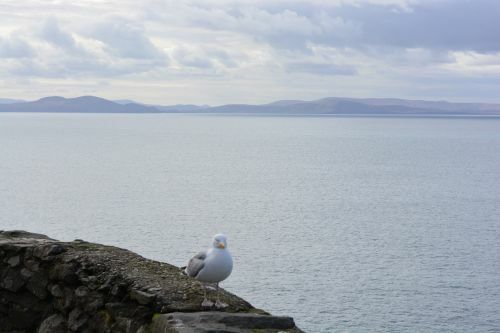 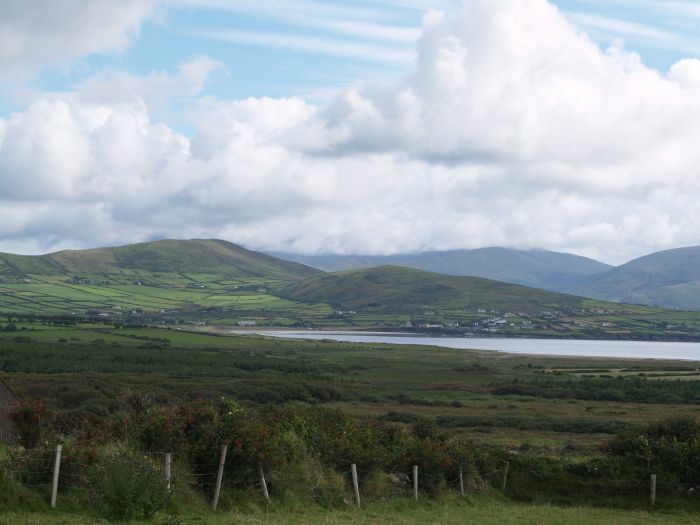 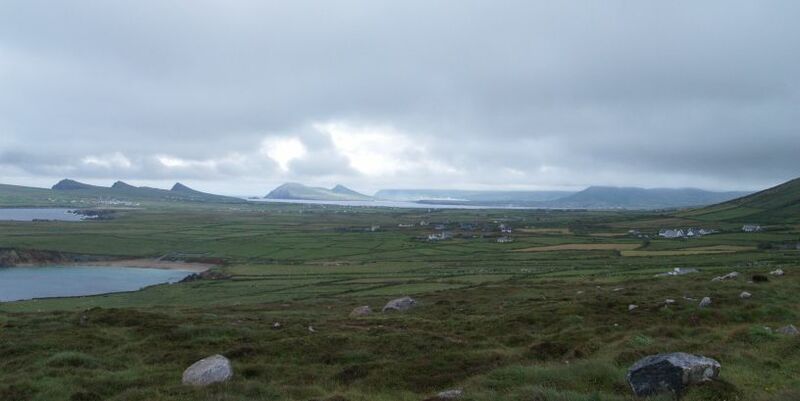 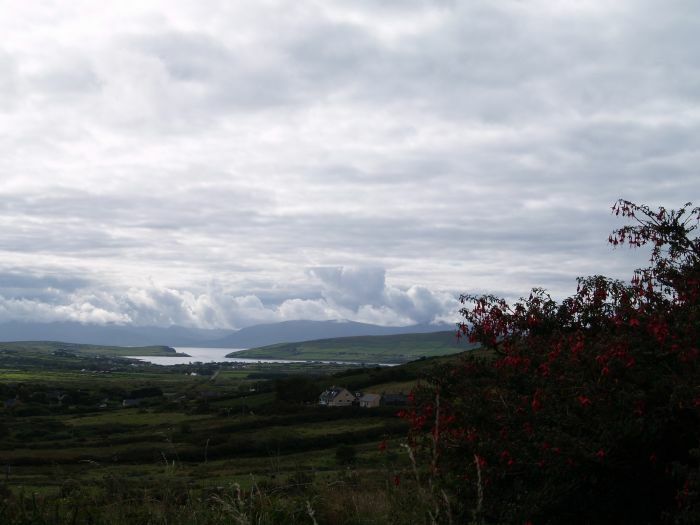 Looking back down to Ventry Bay. 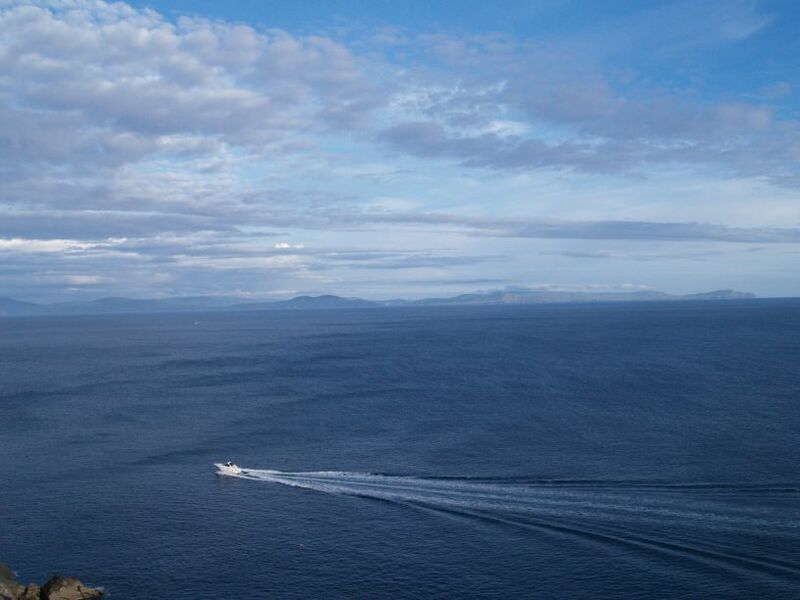 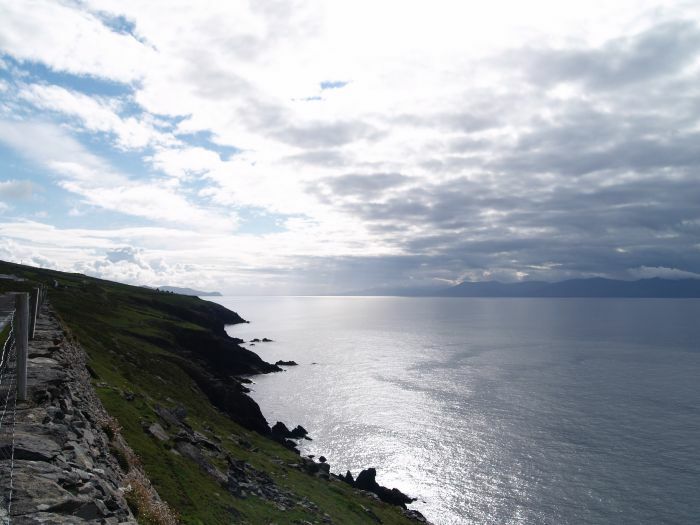 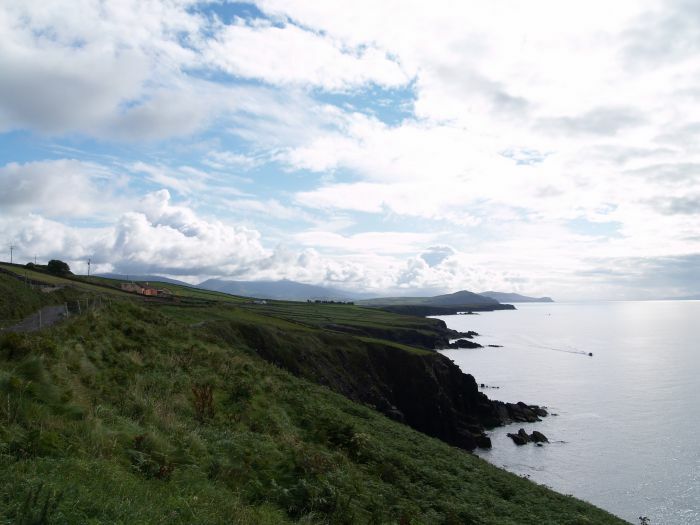 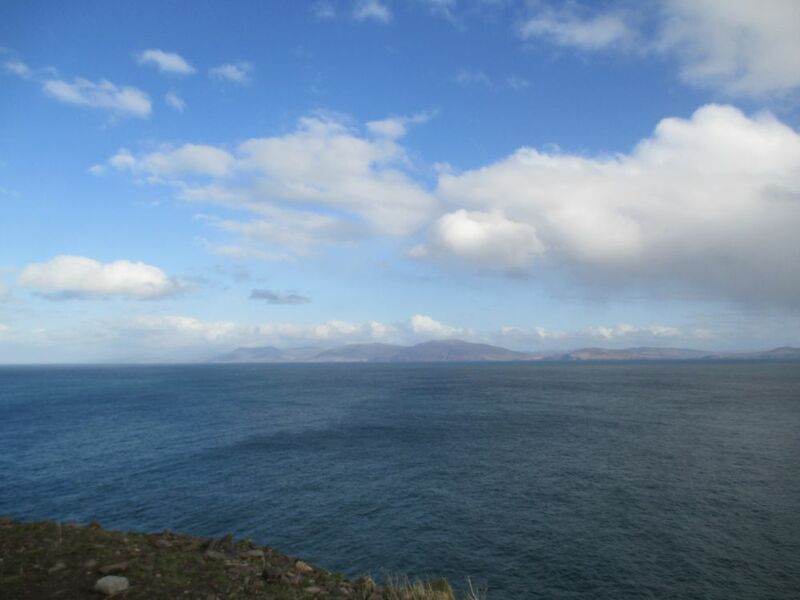 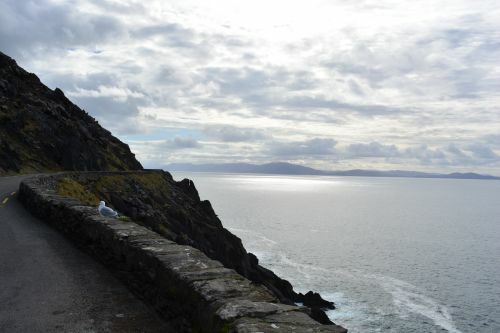 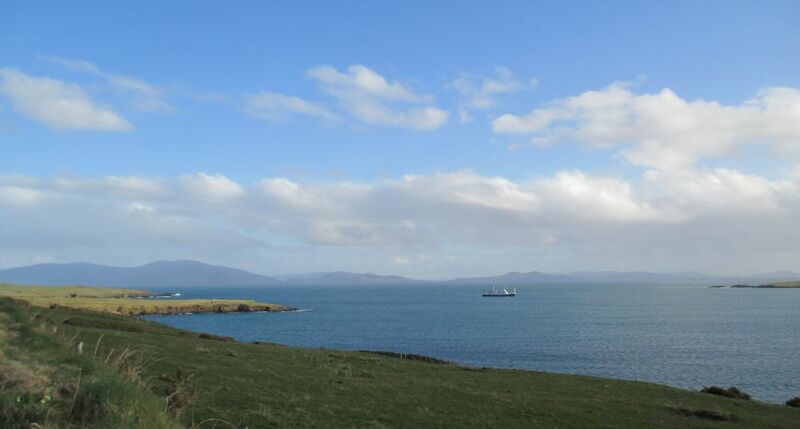 The coastline between Fahan and Slea Head, looking east towards Dingle. 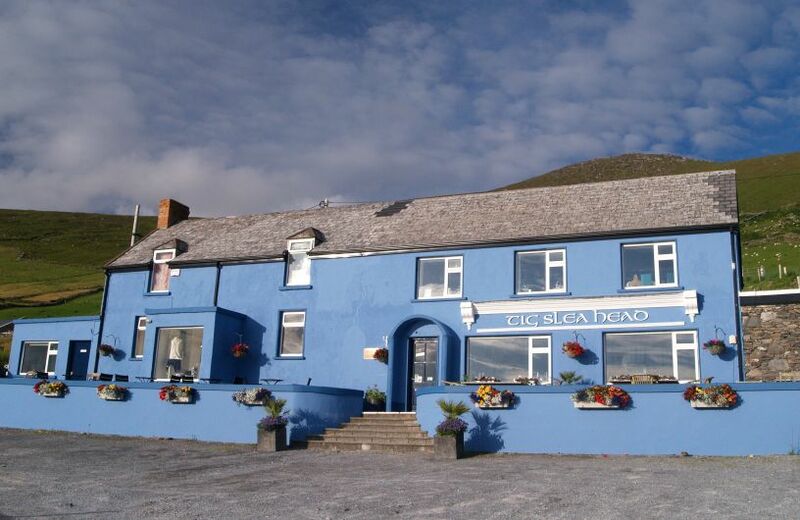 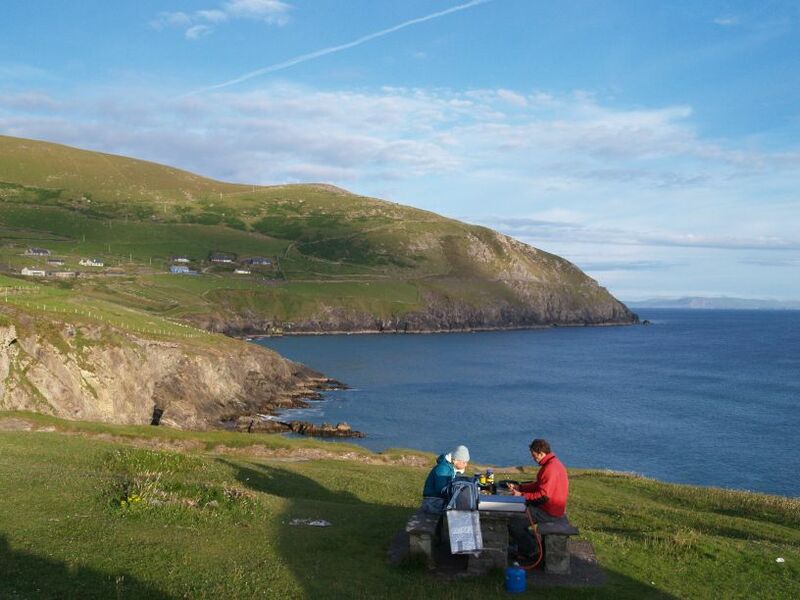 Tig Slea Head Cafe, Dingle Peninsula, Co. Kerry, South-West Ireland has a commanding view of Slea Head (above) and the Blasket Islands (left) on the Dingle Peninsula, County Kerry Ireland. 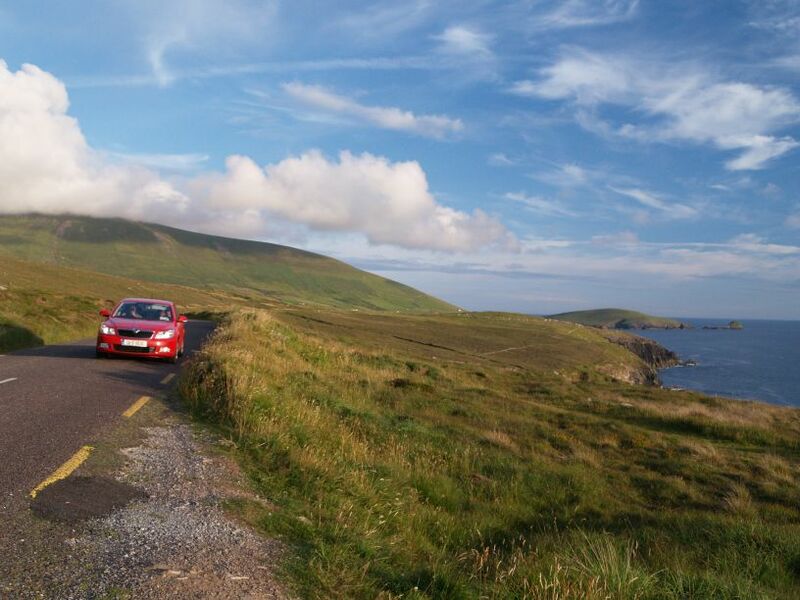 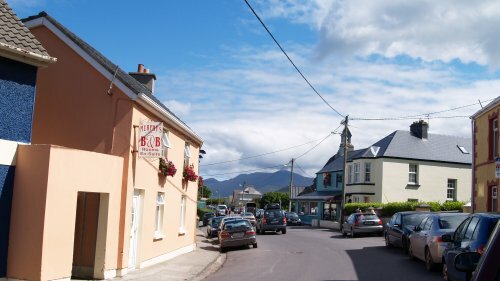 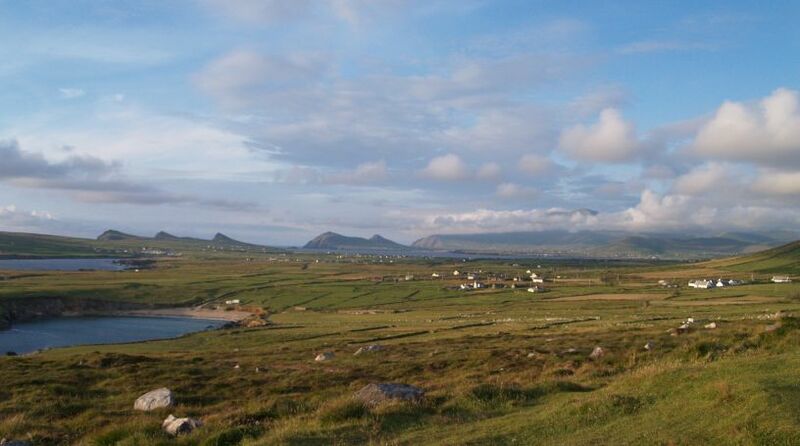 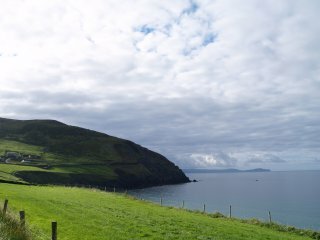 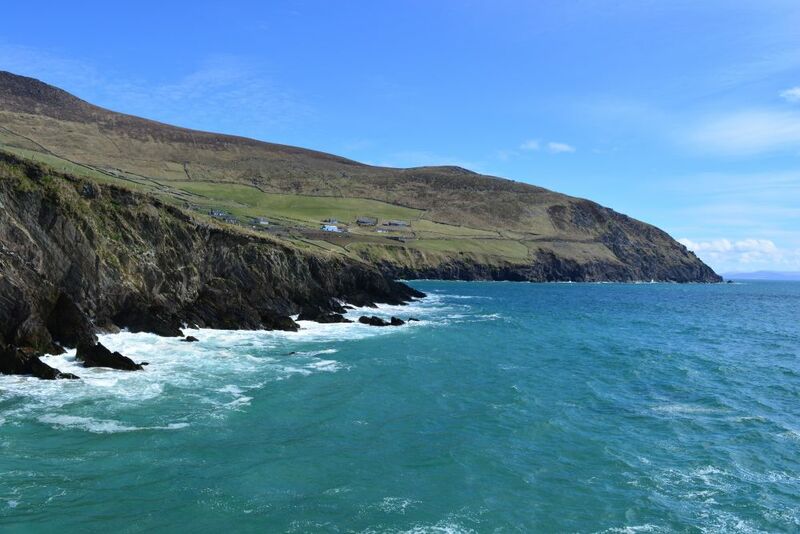 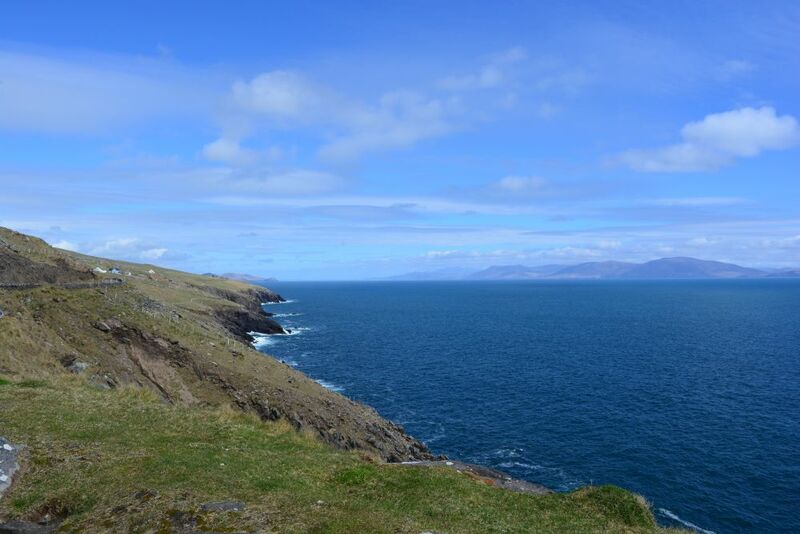 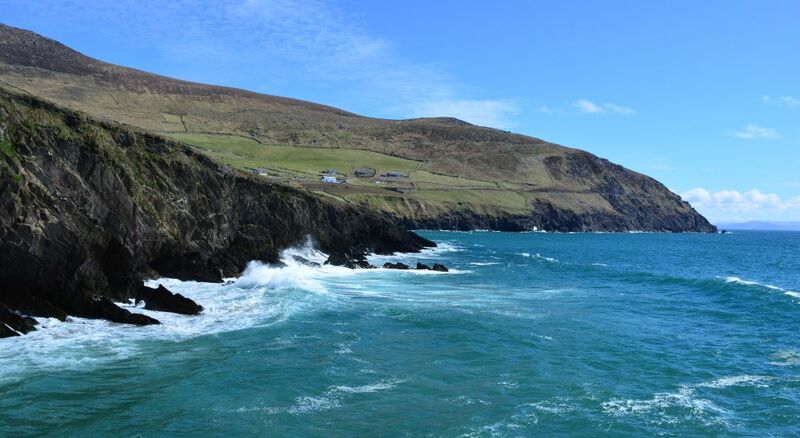 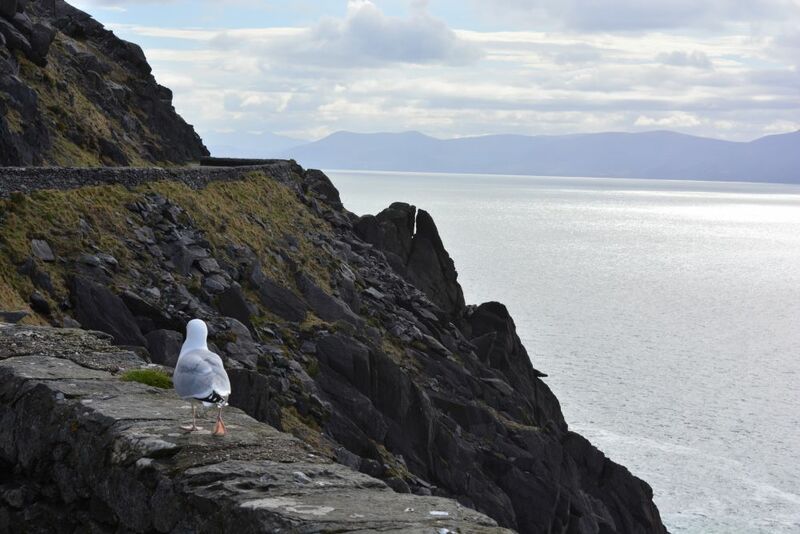 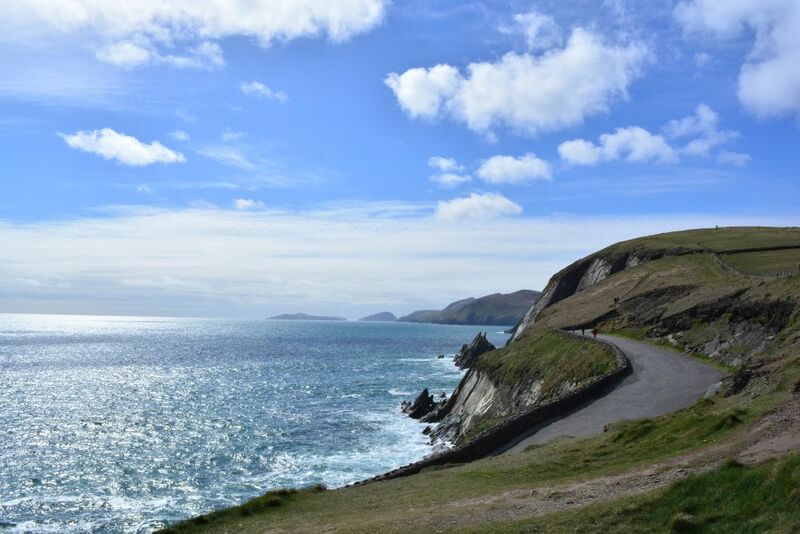 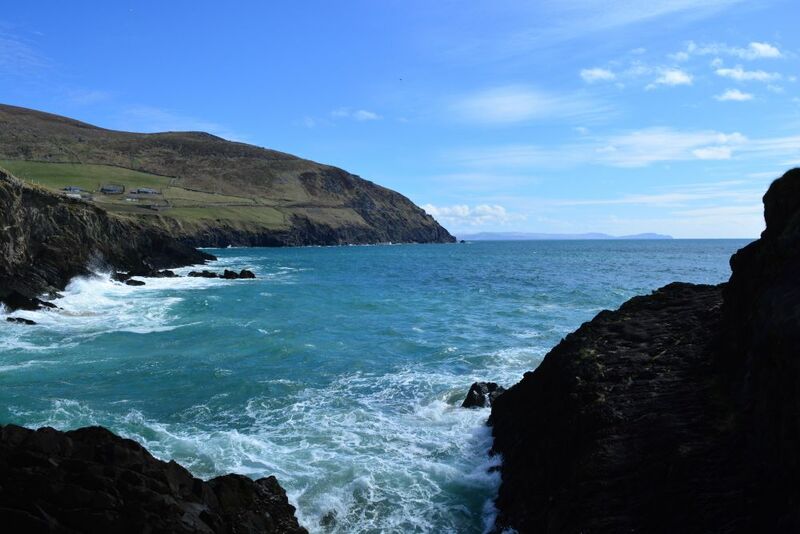 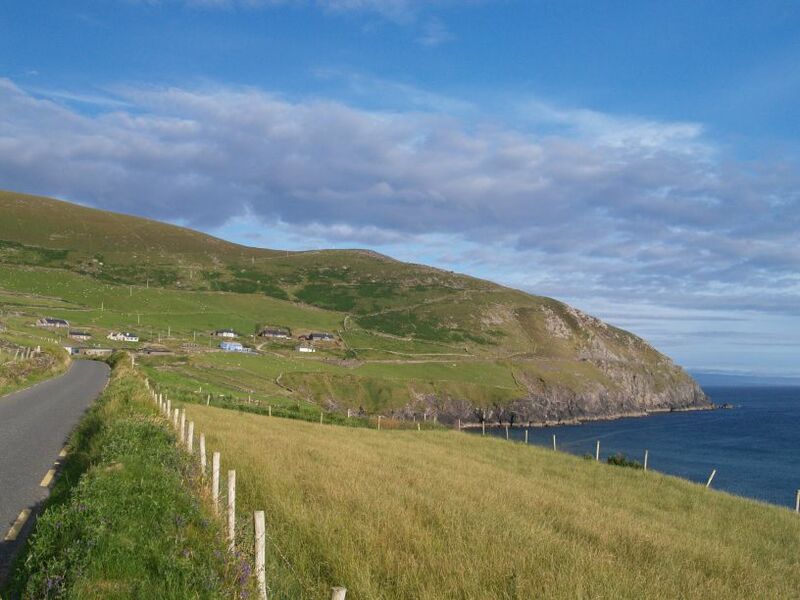 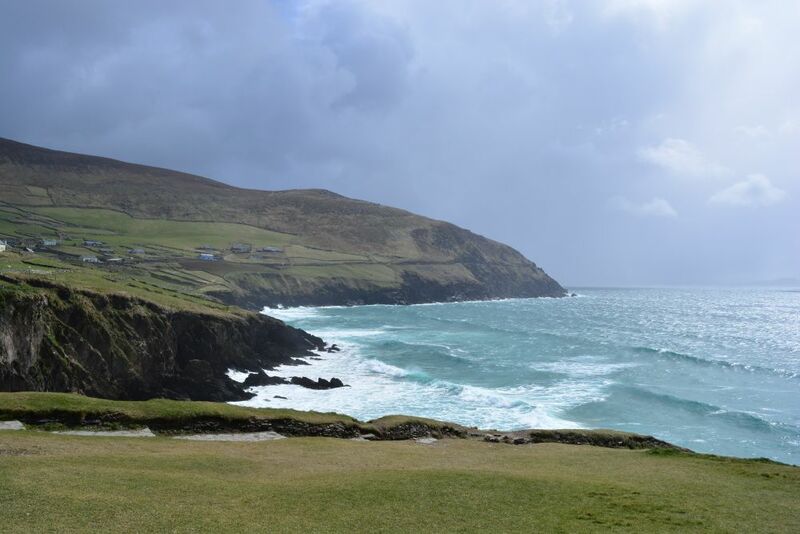 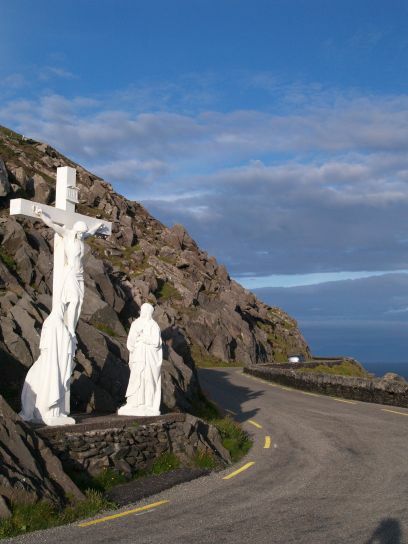 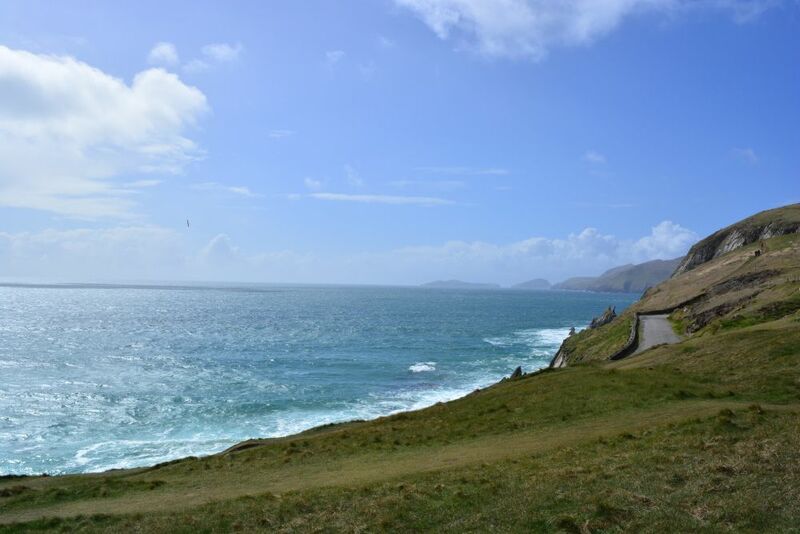 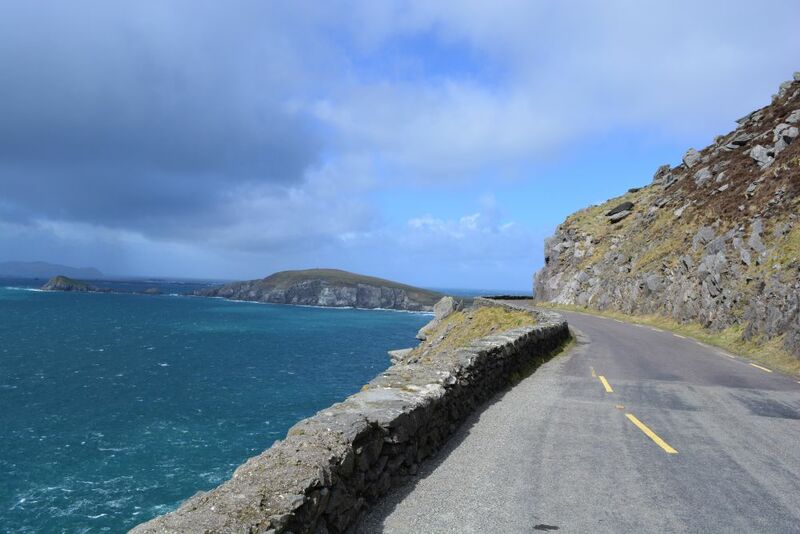 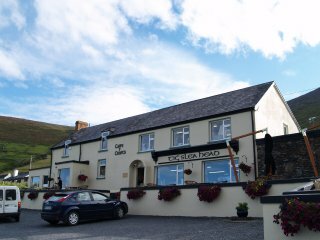 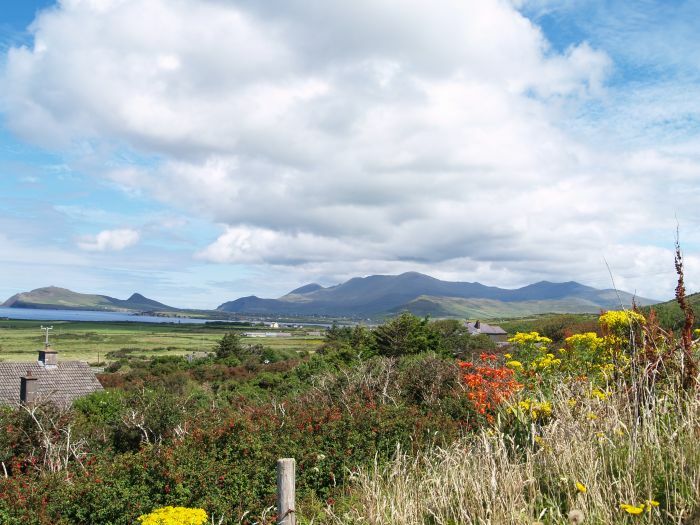 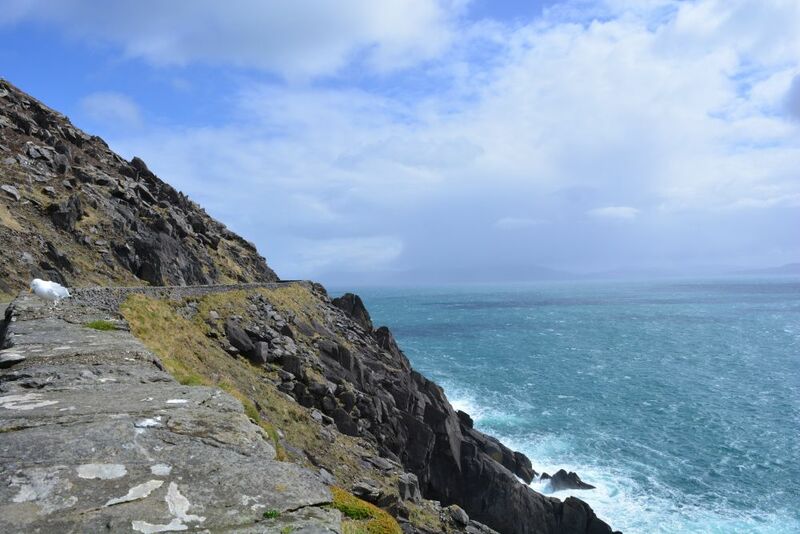 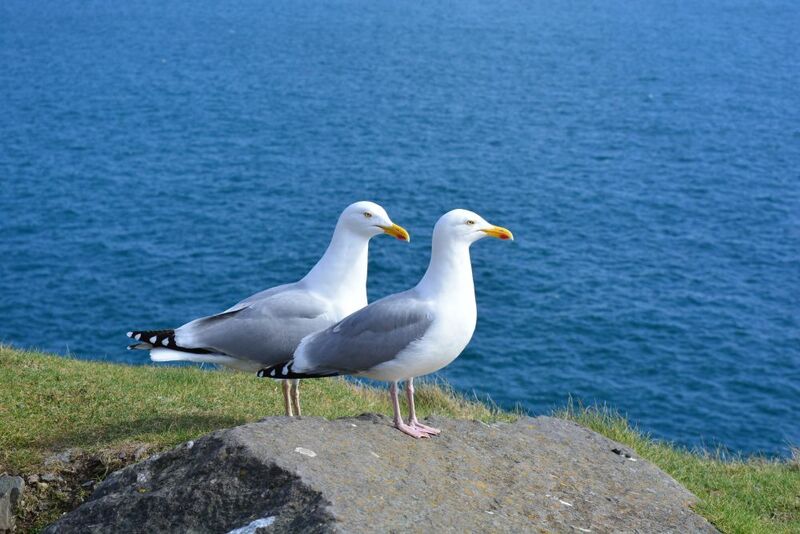 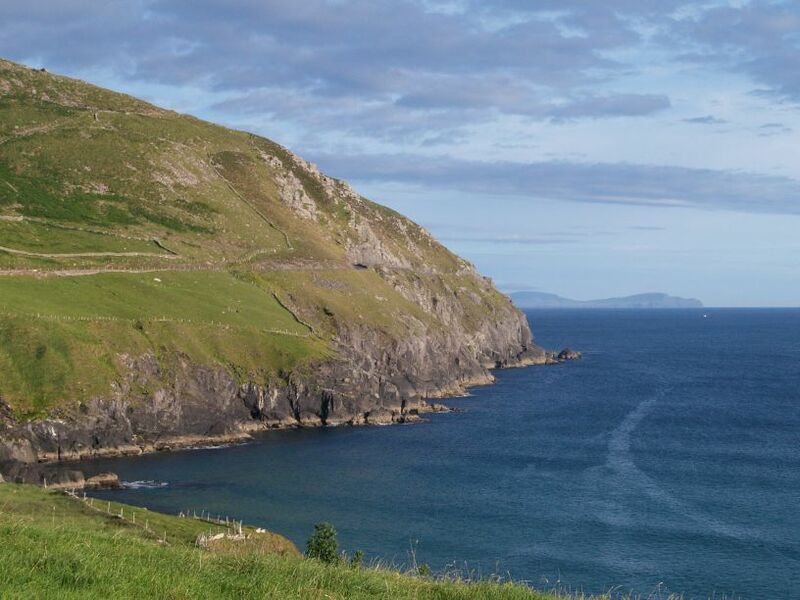 The circular tour of this beautiful and spectacular part of the west coast of Ireland is very popular and its the only tearoom for miles! 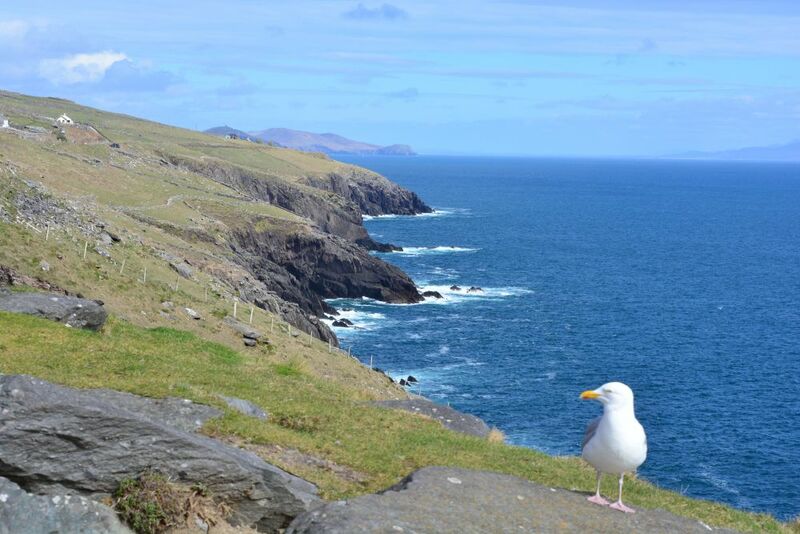 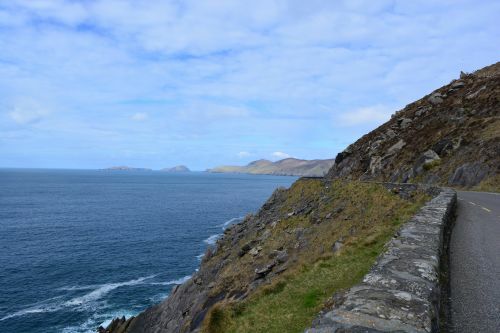 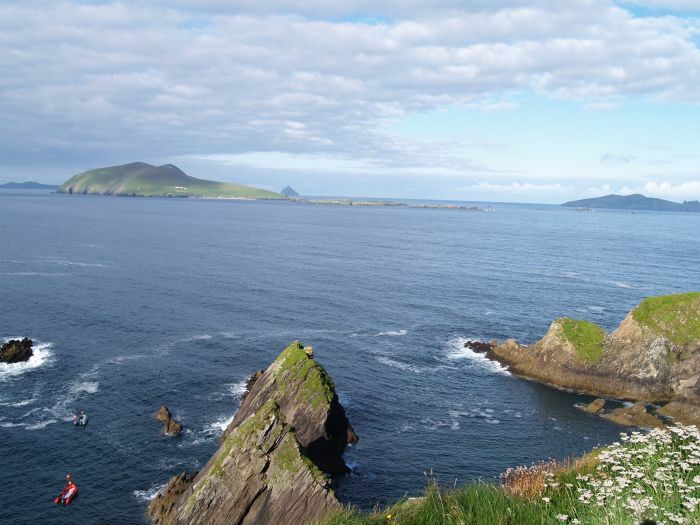 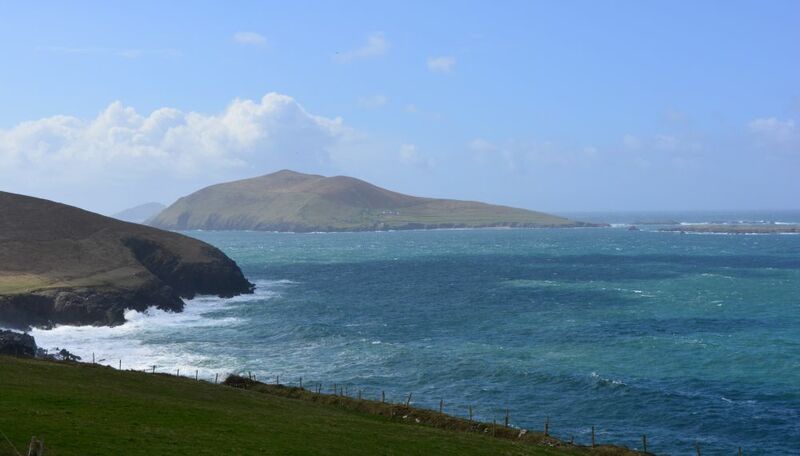 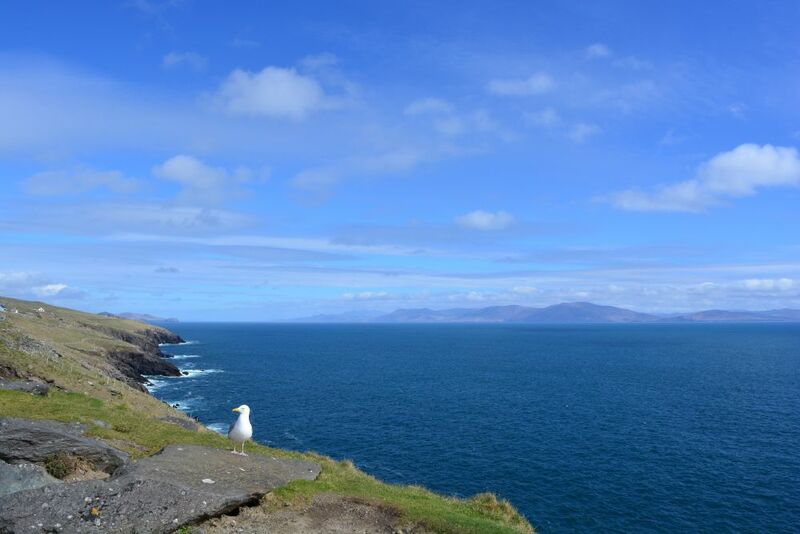 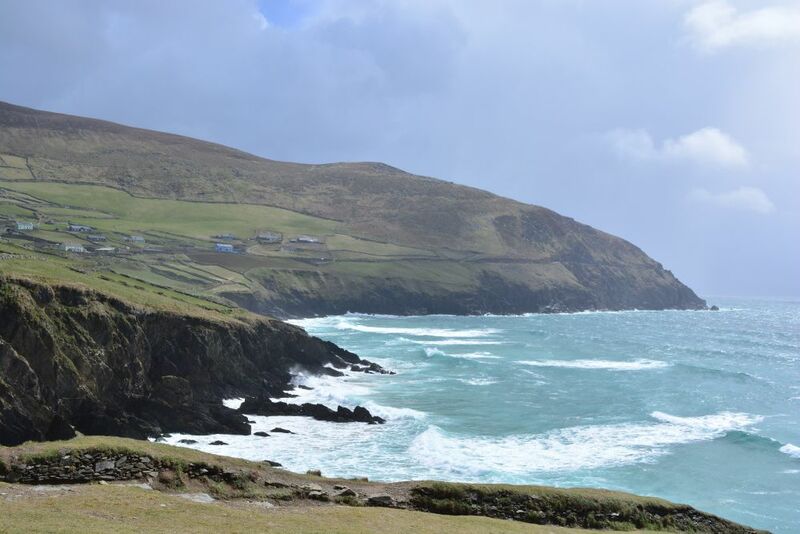 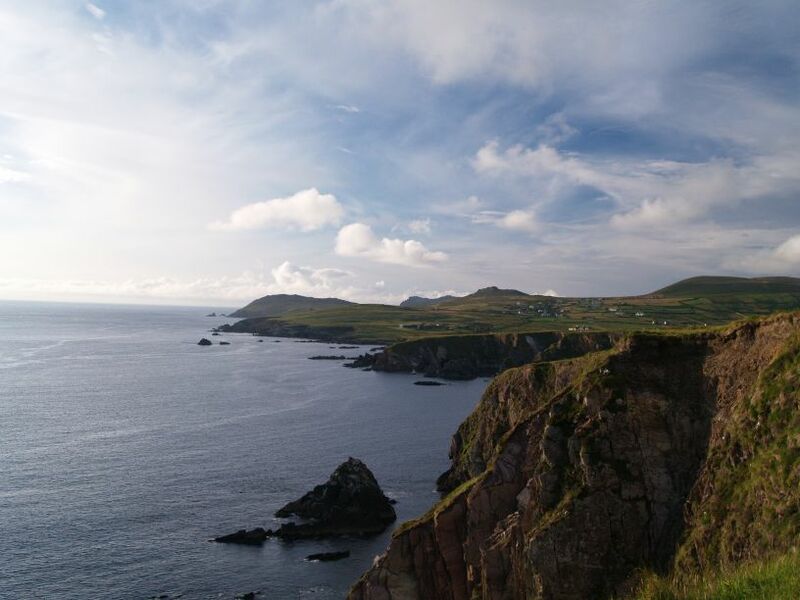 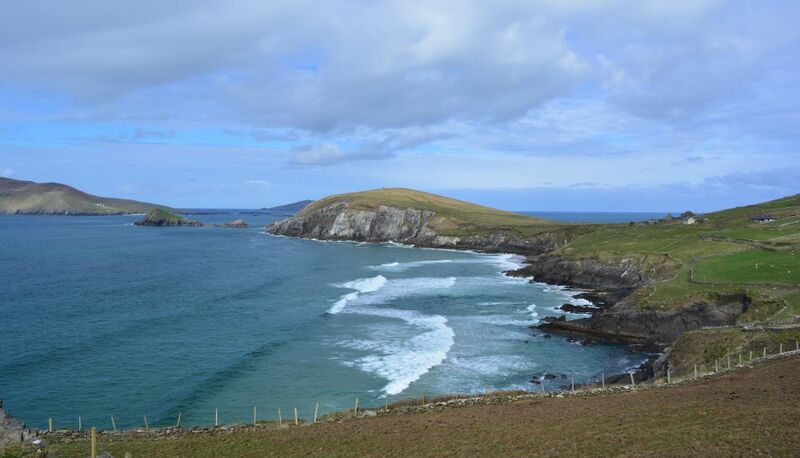 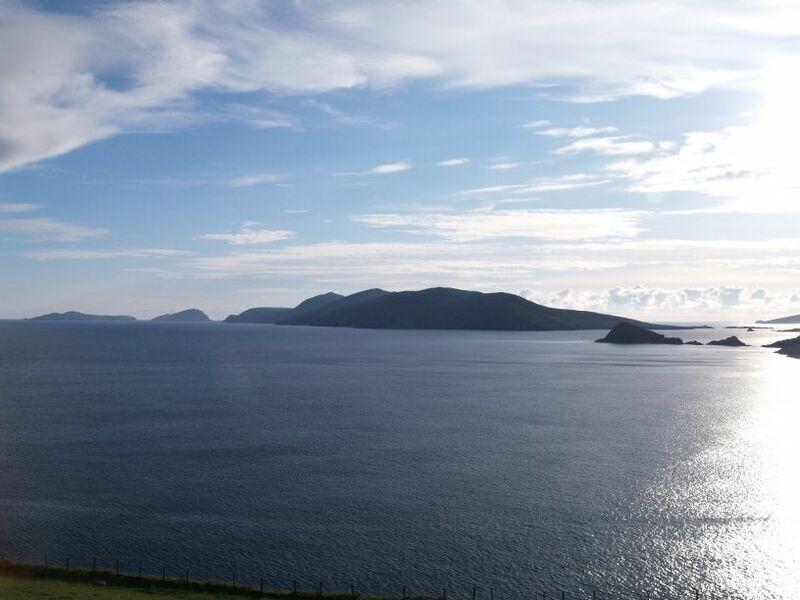 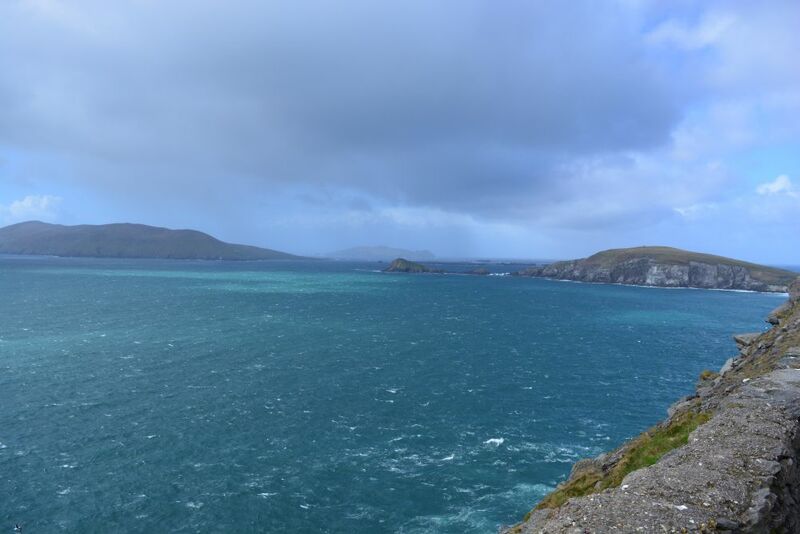 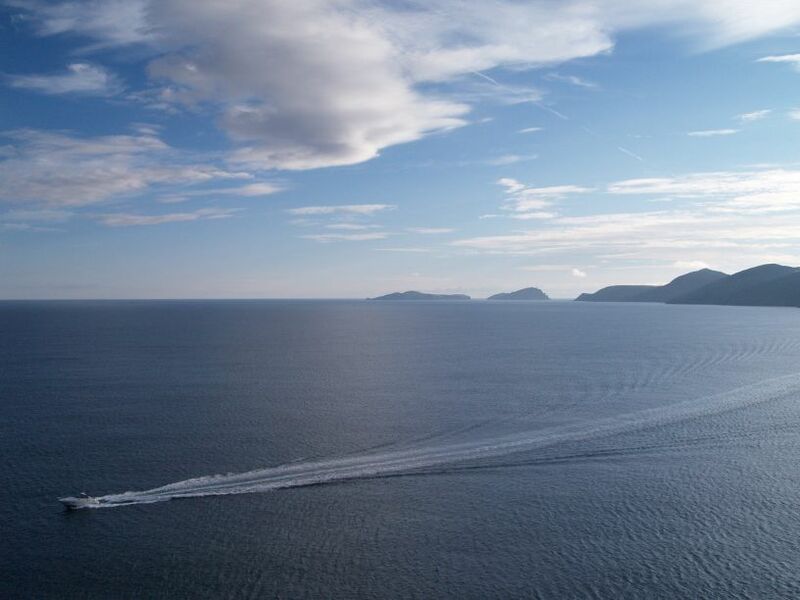 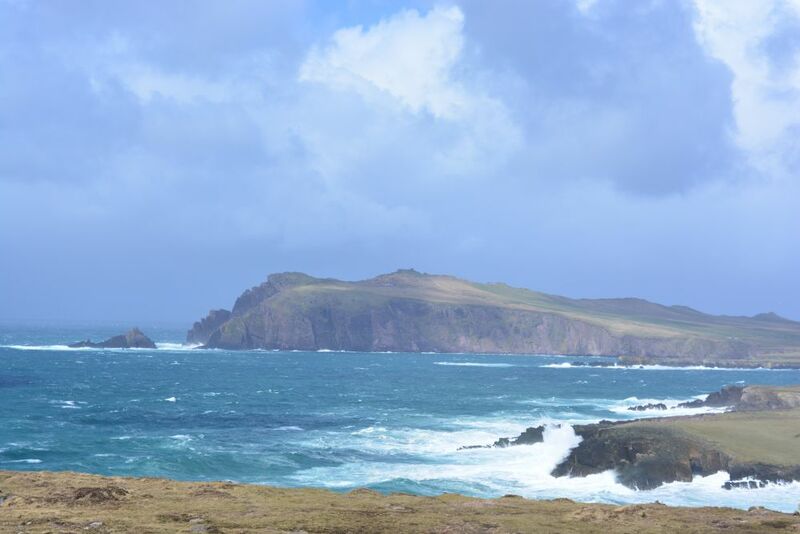 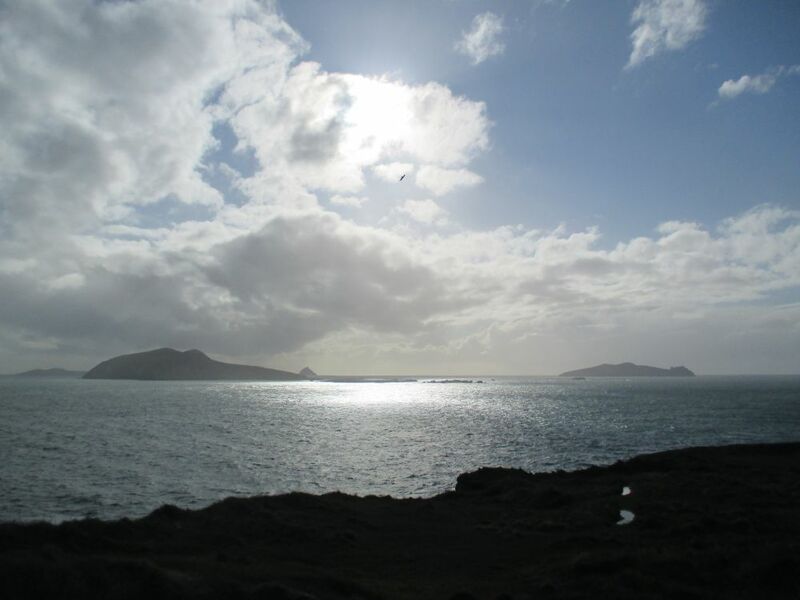 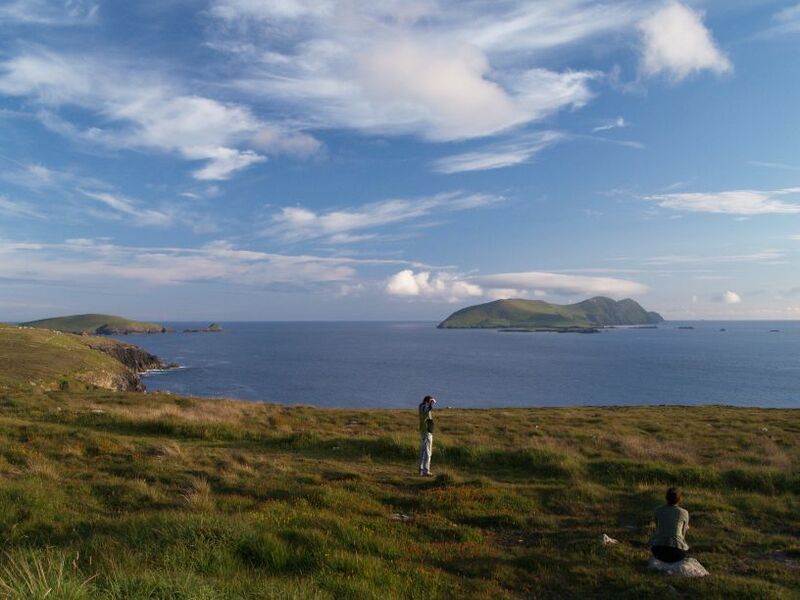 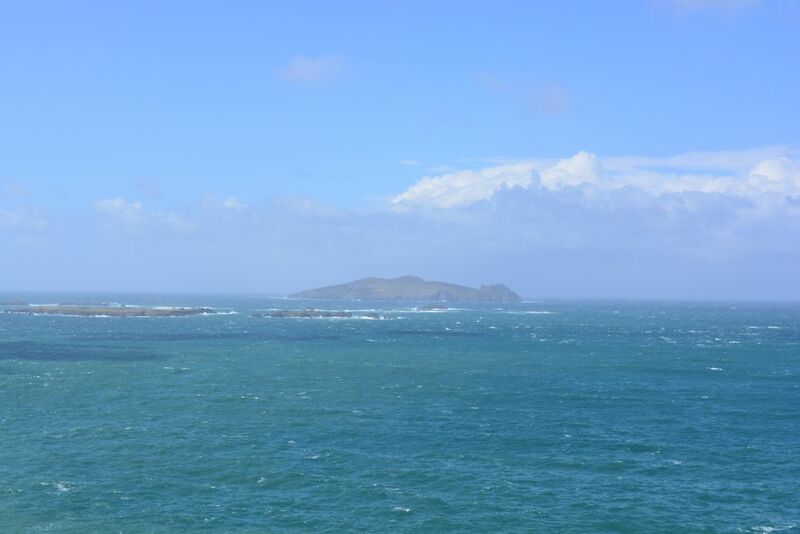 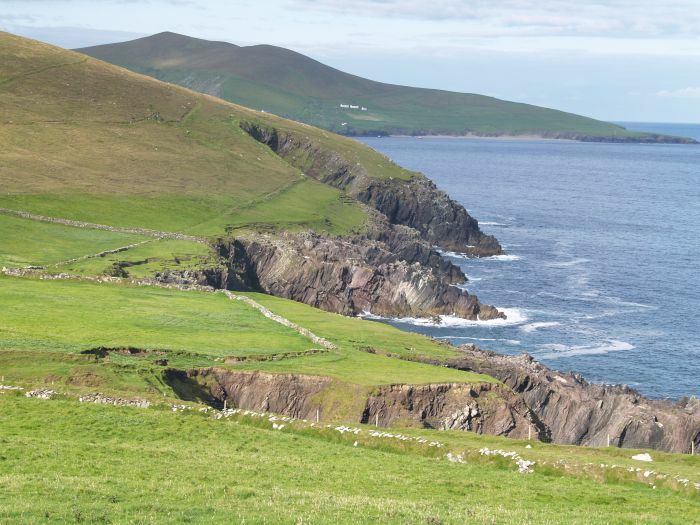 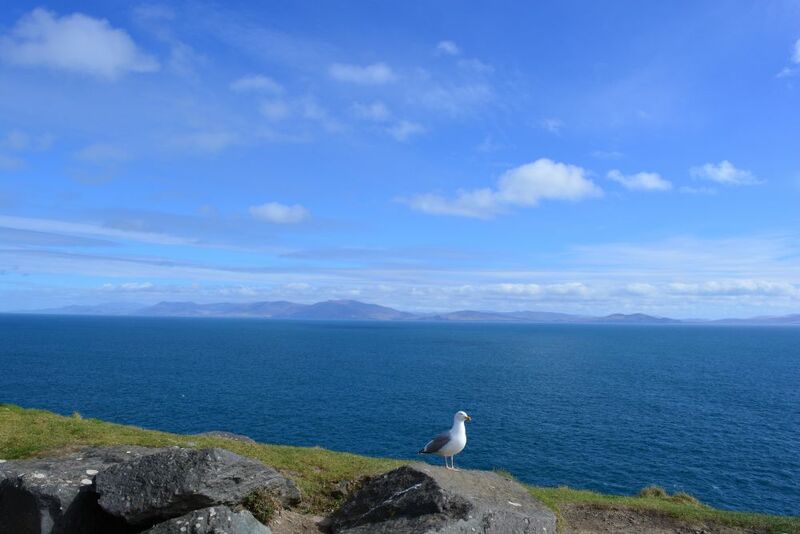 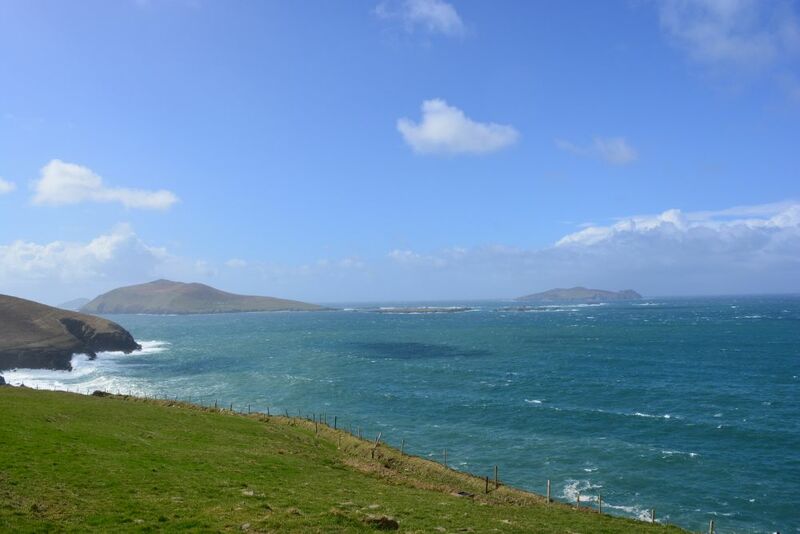 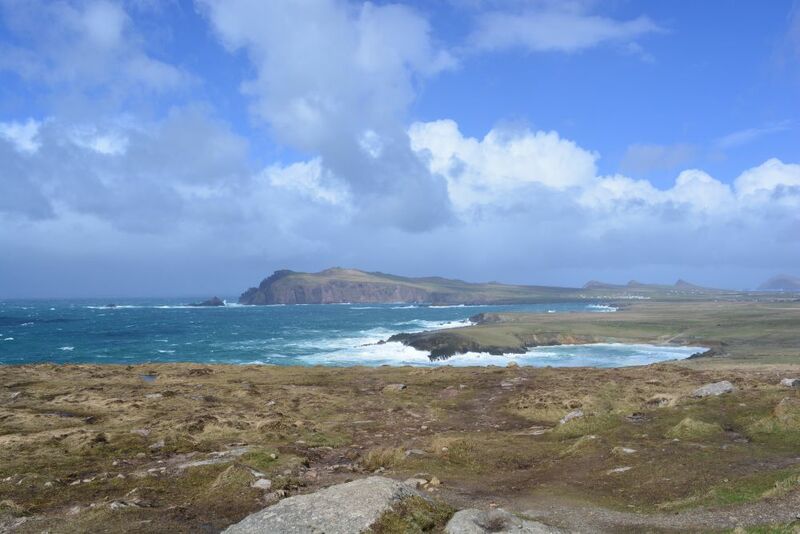 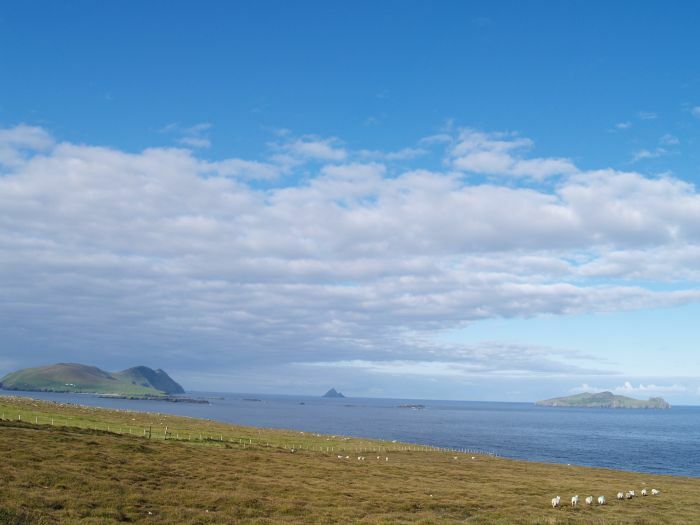 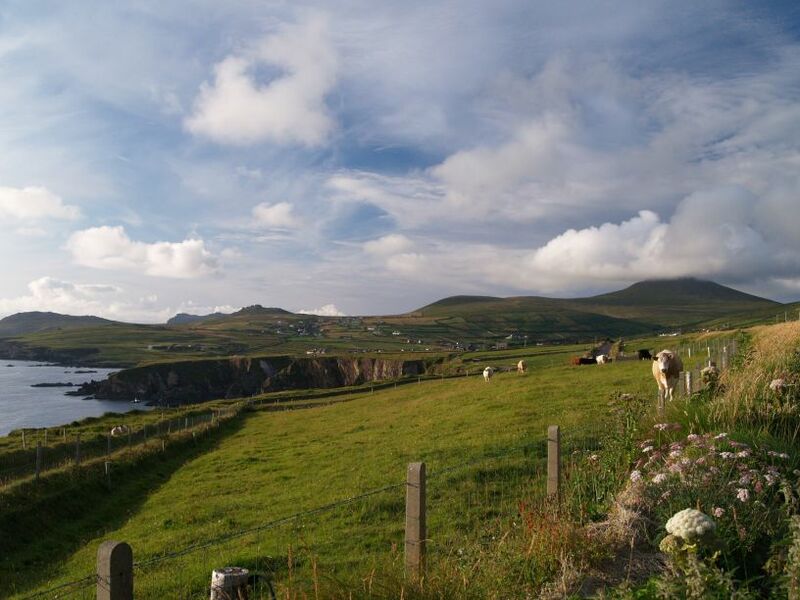 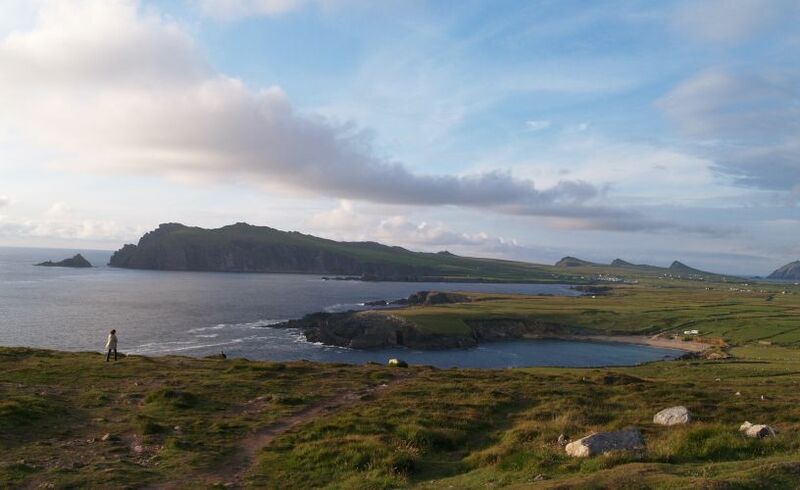 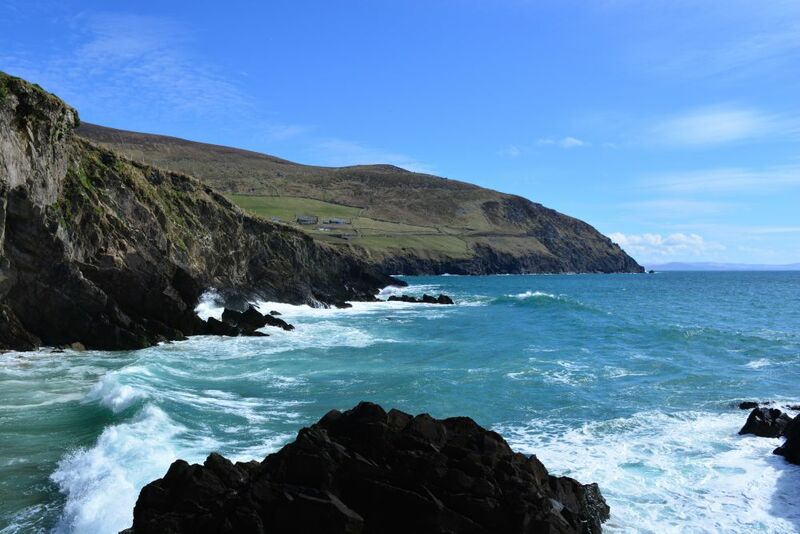 Looking out to the Blasket Islands from near Slea Head. 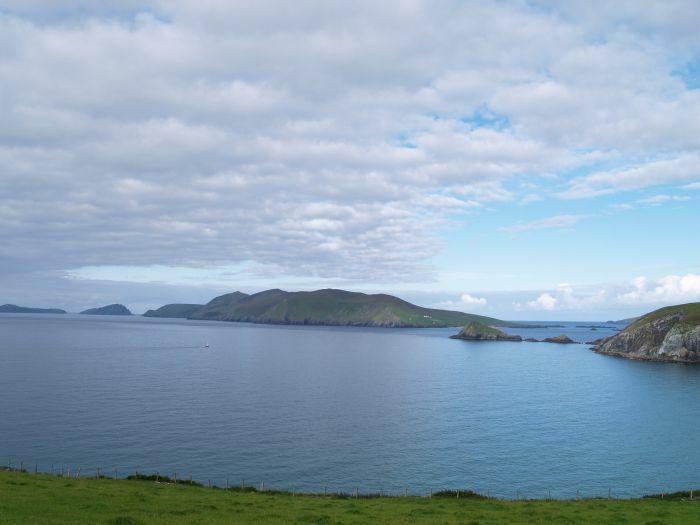 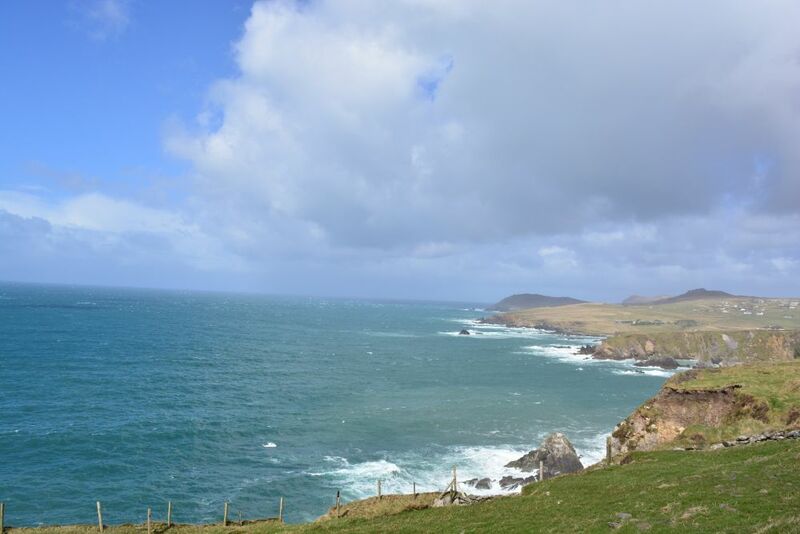 The coast near Dunquin, looking out to the Blasket Islands (more on Dunquin on page 41). 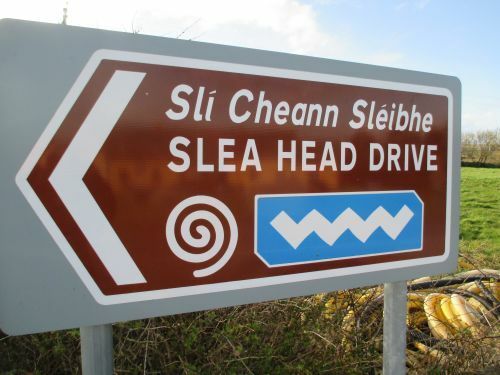 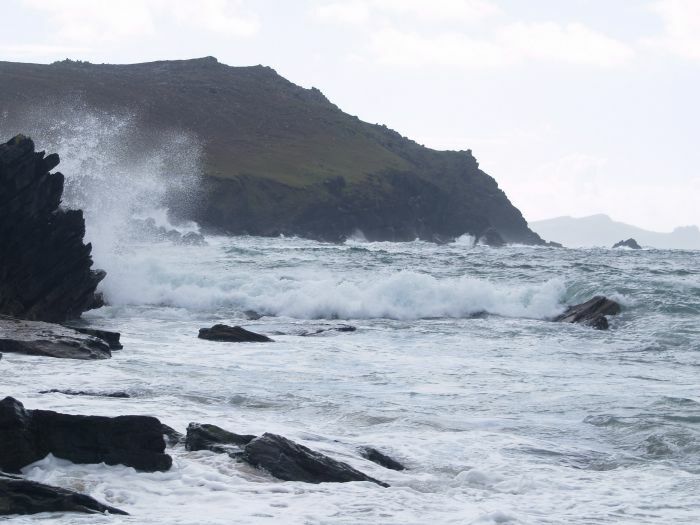 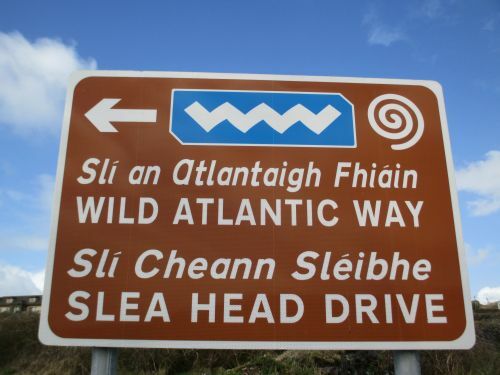 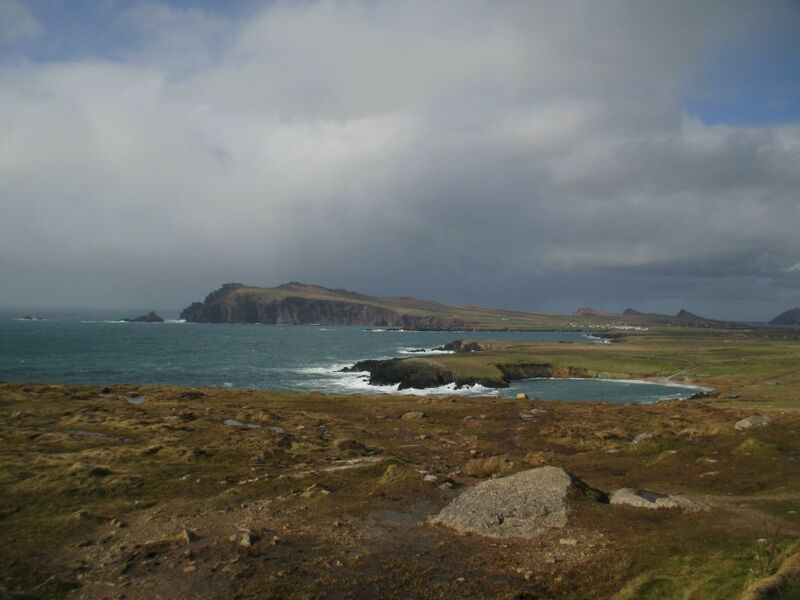 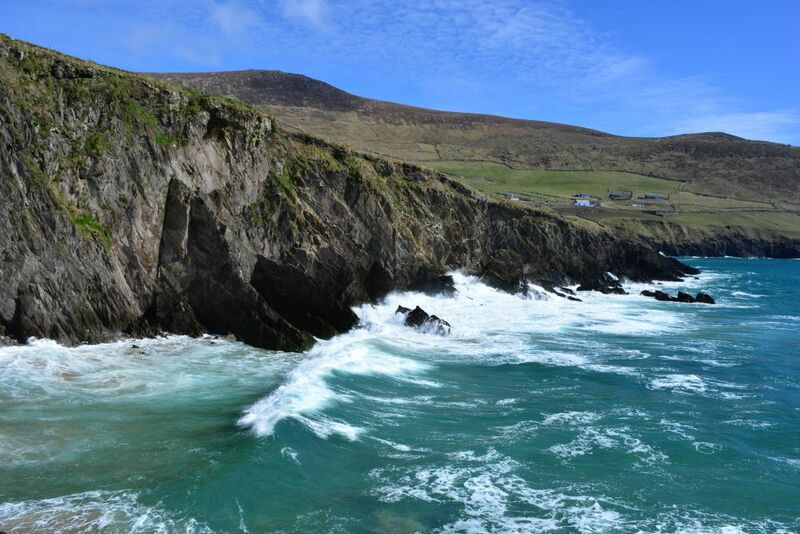 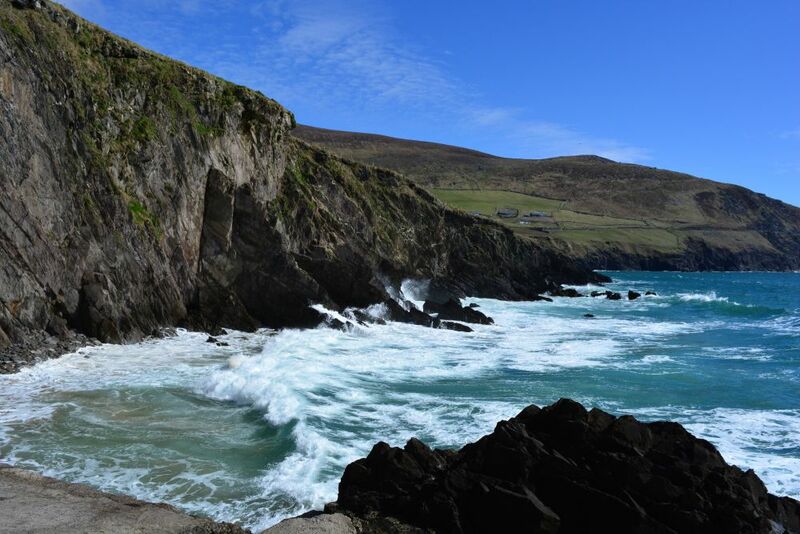 Call in at the little beach at Clogher, take care, do NOT swim, dangerous waves and currents. 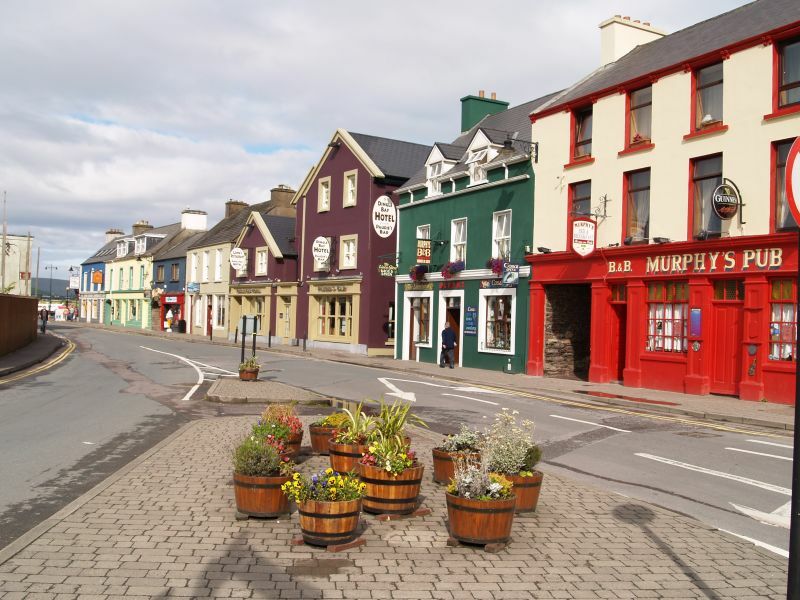 .... which has plenty of pubs, several cafe's and a museum. 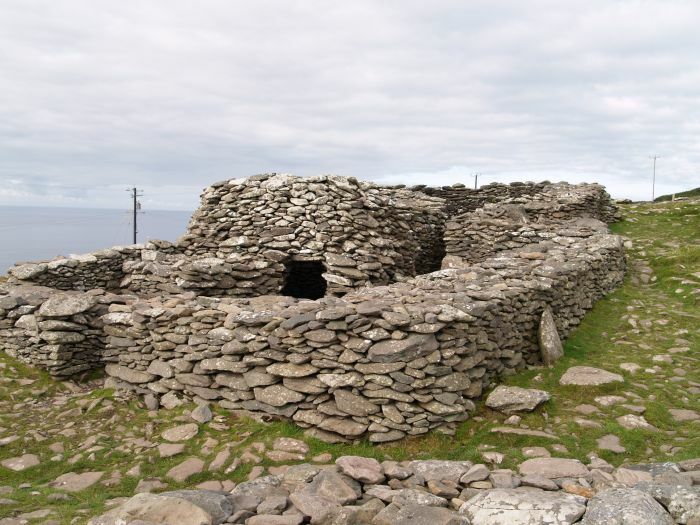 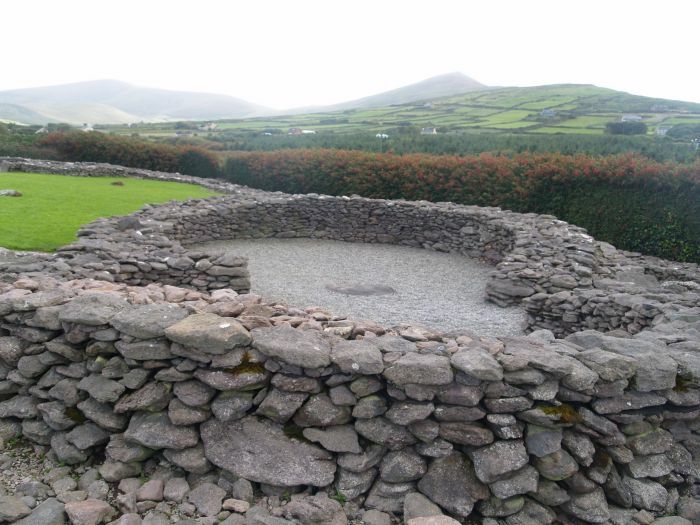 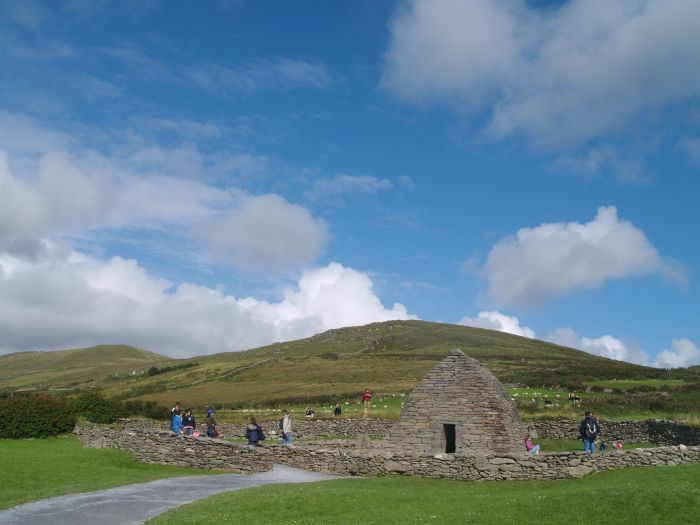 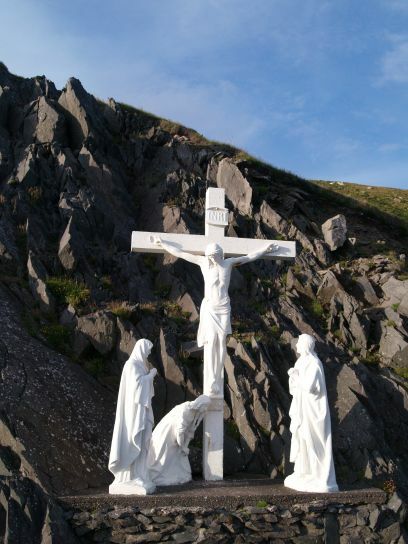 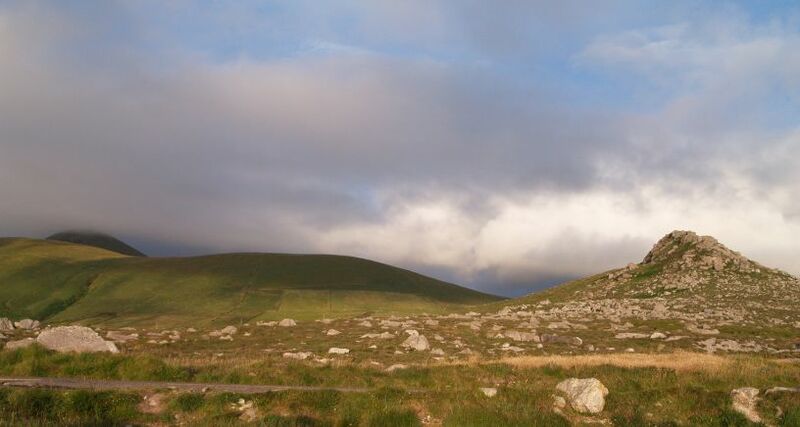 Beyond Ballyferriter on the R599 road there are two historic early Christian monastic site at Reask/Riasc (above) and the very famous Gallarus Oratory (below) (more on these sites on page 45). 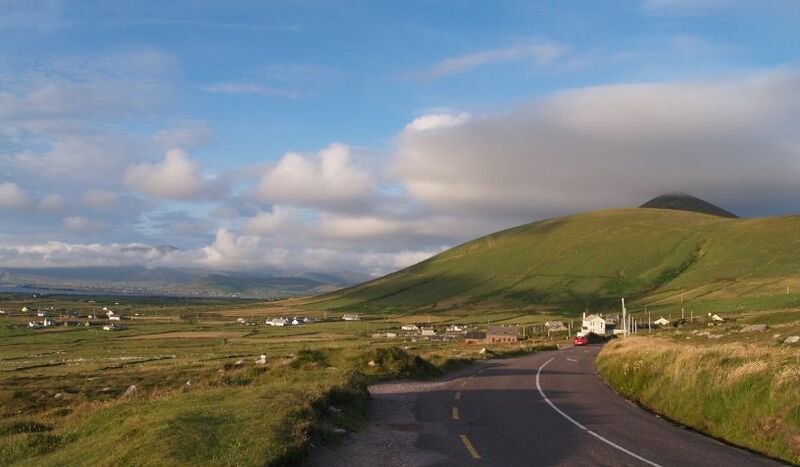 ... and back to Dingle Town for an evening meal and traditional music.